On Thursday, a lovely sunny spring day, I drove up to the very pretty village of Walsham le Willows, in North West Suffolk to visit the potter, Rob Wheeler. This will be Rob’s first time exhibiting at Lexden Arts Festival, but I have been familiar with his work for some time as he often exhibits at the Geedon Gallery. I have a small turquoise glazed pot of his, bought for me as a thank you present when a friend was staying. 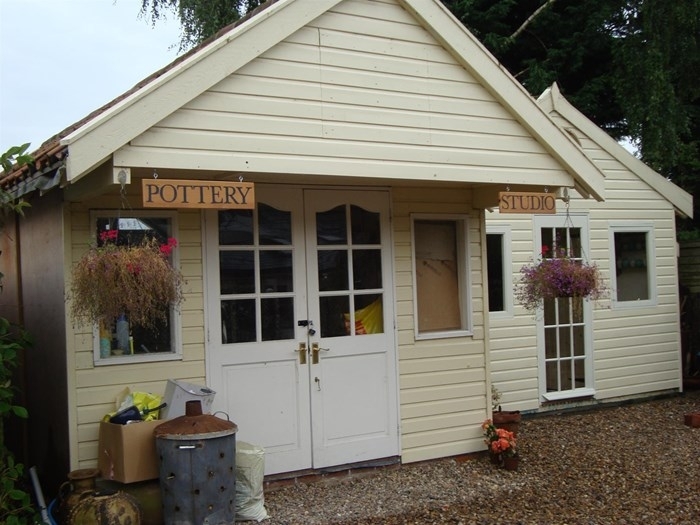 Rob has a large purpose built studio in his garden, with two throwing wheels, and shelves piled high all around with pots in various stages of completion. He told me that he is particularly busy at the moment with teaching – the interest generated by the Great British Throw Down pottery programme resulted in people wanting to have a go themselves. In fact Rob says he is having to limit it, in order to still have time for his own work! He told me he is very interested in fossils, and sea shells, anemones and natural forms, and this is very evident in the lovely forms his work takes. I was particularly interested to see some with an unusual matt finish. I am looking forward to displaying Rob’s work, and I’m sure it will be popular with our Festival goers.